First start with a RELAXED bow hand and arm that allows transfer of WEIGHT to the bow and string. You must let gravity do its job by letting it pull your arm into the string. The bow should ‘bite’ the string – not skate or slide across it. There should be a feeling of the bow ‘digging in’ to string – yet retaining a relaxed sense in the arm. 1. Place bow on string, let arm weight fall into string, move string with bow. 2. Do not play or move bow across string. 3. Just try to move the string about 1/8 inch back and forth. Another concept of tone production when standing is to keep bass almost completely vertical the bow and lean the bass into the bow. This is sort of a reverse concept of bow weight. Teacher: Hold the bow with your right hand at the tip end of the bow. Have the student hang their right hand from the bow using their fingers at approximately the same place where one would normally hold the bow. This helps the student to feel the ‘hanging weight’ of the arm. This works well for French bow. For German bow, tone is generally much easier to produce. The student should first have a concept of WEIGHT going in to the string. 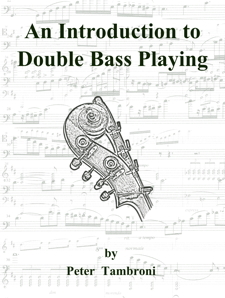 This can be accomplished without the double bass. Also, play in the harmonics – that’s where the bow goes and why it must be moved closer to the bridge. When playing an open E – you can play over the fingerboard because of the G# harmonic there and the thickness of the string. The bow will ride in those nodes and give the best sound. When playing higher on the fingerboard, a new string length is created with the harmonic series moved close to the bridge. Therefore, bow placement needs to be adjusted.